Spring has sprung on Donner Summit and summer is a ways off, but there is still plenty to do in our area..
Get out and enjoy the sunshine! Ride from Squaw Valley to Tahoe City and break for lunch at Bridgetender. 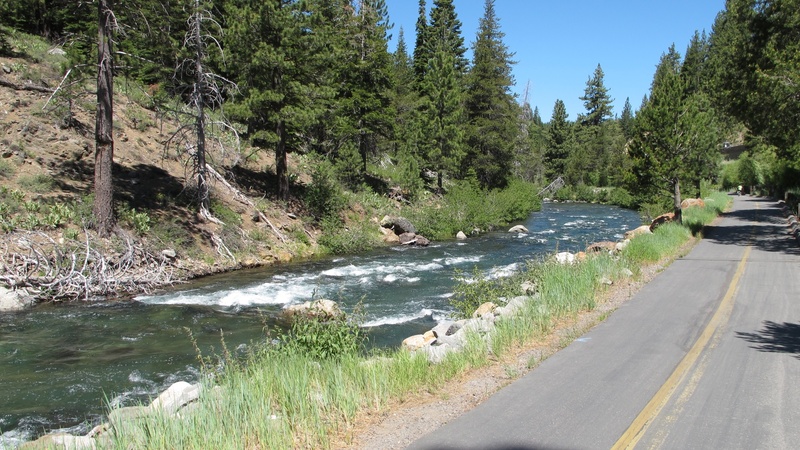 The path is paved, runs along the Truckee River, and is appropriate for all levels of cyclists. An accessible, short day hike taking you by five wilderness lakes. Once the snow melts, this is a gorgeous spring hike. Offering a number of locally made varietals including an Award Winning Pinot Noir, the winery is also a great spot for an early evening picnic. Take advantage of barbecues, horseshoes, and bocce courts. Pet friendly too! Thanks to one of the best winters in years, ski season isn’t over just because Spring has arrived. Ski bluebird days until May 30th at Squaw Valley. And after a few morning turns, how about a parking lot tailgate party? We’re in! The Spring Music Series returns this year with five music-filled weekends. Talented musicians take center stage on the deck at Alpine Meadows for a spring filled with great skiing and exceptional live music. Enjoy a leisurely stroll down Donner Pass Road without fighting any of the usual crowds. Visit stores selling locally made goods, homemade fudge, and high end fashion. The Aerial Tram is one of Squaw Valley’s most popular year-round attractions. Take a scenic ride that climbs 2,000 vertical feet to High Camp, located at el. 8,200′. Once you reach the top, enjoy panoramic views of Lake Tahoe, access the mountaintop hot tub and Terrace restaurant and bar. Located in the heart of the Village at Northstar, the 9,000 square foot skating rink is the perfect ending to your day on the mountains. Enjoy a refreshing cocktail or two by the outdoor fire pits surrounding the rink or take a few laps to burn off any left-over energy. The skating rink is free for all, and for those who do not have skates, rentals are available for $10.